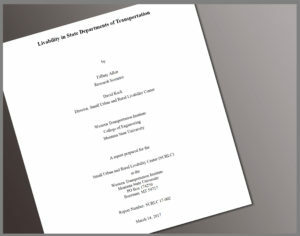 Researchers reviewed the websites of 51 State DOTs, including the District of Columbia, to learn if the DOT has a definition of “livability” or “livable community.” Researchers found a definition of “livability” or “livable community” for about half of State DOTs (28 of 51, including the District of Columbia). The most common theme that ran throughout most of the livability definitions was public health and safety. This was followed closely by the theme of economic development and access to good jobs, with definitions including related wording. About half of the livability definitions included a reference to providing transportation options. All State DOTs that had a definition of livability had some means of implementing it. However, few, if any, State DOTs have livability-specific programs or advisory councils. Rather, livability is incorporated, and in some cases, made a priority through other initiatives and projects. Of the 28 State DOTs that were found to both have definitions of “livability” and be implementing it in some manner, four have performance measures either already in use or being developed. Livability appears to be an all-encompassing and integral part of all processes in some DOTs, while playing only a minor role in others. Learn if each State DOT has a definition of livability, as it relates to transportation. Ascertain and describe the commonalities among the definitions. Understand how the definition is being implemented. Describe the commonalities among states in how livability principles are implemented. Learn whether or not progress is being tracked or measured.